Alright, folks: You’ve got one week till Father’s Day. And you don’t know what to get Dad, because if he’s anything like my dad, he won’t tell you what he wants. I’m here to save you from buying him another 12-pack of socks. So here are a few cool Father’s Day gift ideas for the cool father in your life. Time is of the essence, but spend a few bucks for speedy shipping and you should still be able to get most stuff shipped to you by next Sunday. – PlusUs LifeLink. I looked at lots of high-priced, futuristic gadgets for this post, but this thing seemed the most useful. It’s a USB cable that’s as long as a credit card and as thin as two credit cards, so you can carry it in your wallet or purse and charge your device on any USB port, even if you don’t have a standard charging cable on hand. As someone who (a) is constantly looking at a dying phone, and (b) never has a cable nearby, but (c) always carries my wallet, the LifeLink seems like a no-brainer. – The Tile app. Most of the dads I know have a lot going on — work, kids, household stuff, more work, etc. Little things like keeping up with the keys can fall through the cracks. The Tile app can help. Tile is a tiny Bluetooth tracker that you can stick in or on everyday things like keys, wallet or your cell phone. Then, you can use the Tile app to make a Tile “ring” (as you would if you called a lost phone), or you can view the last place the app recorded your item. Sounds like a time (and frustration) saver! – Nest Learning Thermostat. Is your dad tired of the eternal thermometer dance? Up, down, up, down. Adjust in the morning. Adjust at bedtime. Turn it down while making dinner. Crank it up when the kids get out of the bath. It never ends. But it could, with the new Nest Learning Thermostat. Use it for a little while and it picks up on your routines, senses when people are home or not, and adjusts to seasons. The thermostat learns about you and what temperature you like and builds a schedule for your home. Best of all? According to the Nest website, studies showed that the Nest has saved over 4 billion kWh of energy since 2011, saving people an average of 10-12 percent on heating bills and 15 percent on cooling bills. Who doesn’t like saving some dough? – Star Wars flash drives. These things aren’t necessarily new, but with all the Star Wars fervor over the past several months, they’re a fun way to inject a little levity into the daily grind and to celebrate one of the greatest film series of all time. 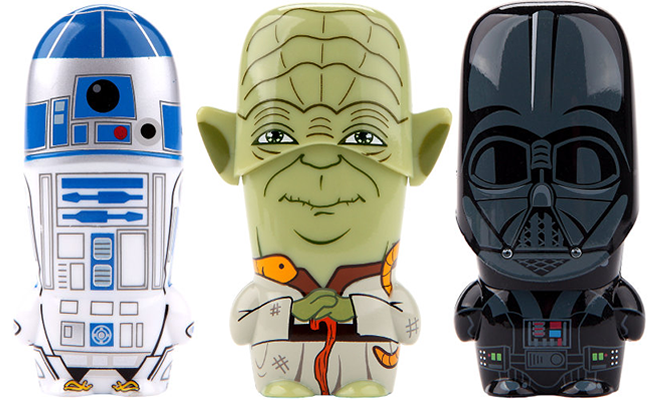 Mimoco’s got Darth Vader, R2-D2, Jabba the Hutt, Yoda, Boba Fett, Luke Skywalker and more. 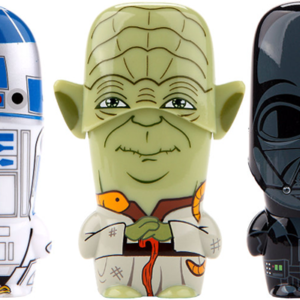 If Dad isn’t a Star Wars fan, check out the company’s other lines of flash drives, such as Transformers, Star Trek, South Park and G.I. Joe. – Simple Smoker. Nothing says “dad” more than smoked meats. Well, that’s probably not true, but smoked meats are still pretty cool. They’re meats … that are smoked! Anyway, Char-Broil makes an easy-to-use product called the Simple Smoker that connects to your smart phone so you can control and monitor the smoking process without hovering over the machine. The app also contains a large library of recipes for bonus inspiration. The Simple Smoker stands only 27 inches tall and uses minimal wood chips, but still delivers a flavorful piece of meat, according to reviews. – West Coast-style IPA beer brewing kit. Dads like beer, right? Many do, at least. And maybe your dad is intrigued by the idea of making his own beer, but doesn’t know where to start. Consider, then, this inexpensive brewing kit that contains everything he’ll need to make a West Coast-style IPA. That includes malt extract and grains from Wisconsin and hops from the Yakima Valley in Washington, plus all the necessary equipment. The resulting IPA has “a complex profile with spicy citrus notes,” according to the Uncommon Goods website. (Note: If West Coast IPA isn’t your dad’s bag, the site also offers kits for ales from Vermont, Texas and the South.) Cheers!